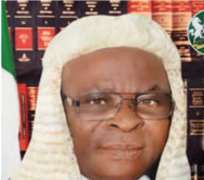 Angered by what it called "a satanic plot devised by desperate men in power to remove Chief Justice of Nigeria (CJN), Justice Walter Samuel Onnoghen," a pro-democracy organisation, has told the Muhammadu Buhari regime to perish the idea of forcing Onnoghen out or be prepared for a popular resistance. The group, Coalition in Defence of Nigerian Democracy and Constitution (CDNDC) said it would mobilise Nigerians to resist another phase of assault on the judiciary," adding that "the unfolding plot was part of Gen. Buhari's plan to drive Nigeria into a closed society where only extremists can survive." CDNDC in a statement by its Convener, Ariyo-Dare Atoye, said: "from the onset, the despotic Buhari regime had fruitlessly sought to control and undermine the judiciary to do its illegal bidding, but it failed. "It was when that satanic agenda crumbled that the resort to the barbaric clampdown on judges commenced, but fortunately, Nigerians were wise enough to resist their wicked onslaught and the judiciary was also courageous enough to stand firm. "The latest demonic assault on the CJN, Justice Walter Samuel Onnoghen by extremists in power will also be massively resisted. They can only try, they will not succeed, they will fail like before and they will be put to serious shame. "For now, we do not want to go the route of the popularly known resentment of the Buhari regime for a Southern CJN, including the hidden plan of his government, but when that time comes, we will do the needful. "Let it be known to all that the Buhari-Osinbajo regime is passing phase that will soon fizzle out, and we must be courageous enough not to bow to tyranny or allow the government to brutally redefine who we are as a people," the statement added.